Speed skeitchin, or speedskeitchin, is a competitive furm o ice skeitchin in which the competitors race each ither in travelin a certaint distance on skeitchs. Types o speed skeitchin are long track speed skeitchin, short track speed skeitchin, an marathon speed skeitchin. 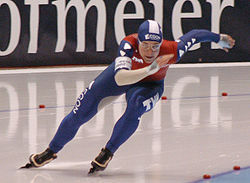 In the Olympic Gemmes, lang-track speed skeitchin is uisually referred tae as juist "speed skeitchin", while short-track speed skeitchin is kent as "short track". The ISU, the govrenin body o baith ice sports, refers tae lang track as "speed skeitchin" an short track as "short track skeitchin". This page wis last eeditit on 23 Februar 2018, at 07:00.